There are so many benefits of drinking water, you already know you should be drinking more. Water keeps you hydrated, helps you lose (yes, lose!) excess water weight, and is just plain healthier than colas. But it's so hard to drink enough. Experts recommend you drink at least 8 glasses a day. Eight times a day I'm supposed to go to the sink, fill a glass with water, and drink it down? Never happen. To get around this, I developed a simple system based on water bottles. You've seen them, the clear plastic bottles with the white caps. 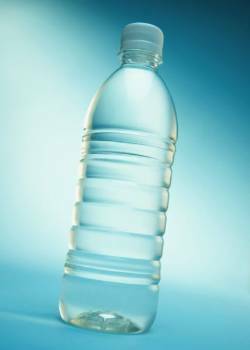 Brand names such as Evian, Aquafina, Dasani, and so on. Using my system, I drink between half a gallon and a full gallon of water every day (the equivalent of 8 to 16 glasses of water). What's my system? Simple. I just keep refilling the bottles, and I stash them all over the place. I have a few bottles in the fridge. A bottle next to my bed. A couple bottles on my desk at home. Two bottles in the car. So wherever I am, I have easy access to water. There's no pressure for me to "drink a glass" eight times a day. With the bottle system, it just happens naturally. It's not expensive either. The bottles from a six-pack of bottled water last for weeks. I just keep refilling them from the tap. Watch out, though. Some bottles are flimsier than others. With some of the cheaper brands, the bottle gets crinkled after a few uses and doesn't hold its shape. The brand I buy these days is Aquafina. For some reason their bottles are sturdier. And I always buy the 16.9 oz (500 ml) size. The 32 oz bottles are a little too intimidating. So get a few plastic water bottles, put them everywhere, and start drinking!